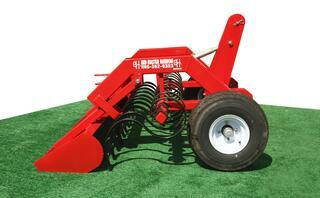 The Red Master Harrow is one of the most high-tech horse arena harrow implements on the market today. This harrow was designed to prepare the best possible working surface in horse arenas with or without a knowledgeable tractor operator. The Red Master Harrow will maintain a level surface including the kick boards. You have total control of the working depth of the air pockets (cush). The float pan will also compress your surface to maintain consistency. This harrow is excellent for winter and summer maintenance — most harrows will not do both. Due to its free standing capabilities (on tires), the Red Master Harrow is one of the most goof-proof horse arena implements on the market today; it does not allow you to scrape down to the base. Not only does it work up the footing surface, but the spring teeth also work the footing by adding air to the footing. This is your "cush" to any desirable depth that you wish, but it is also a leveling device for your horse ring. The double-sided tips are reversible for a longer lifespan. This is two pieces of tractor equipment for the price of one.